We all have qualms and issues about our Breaking Community, but when it gets down to it, we love it. With such a unique dance, that combines art, music, athleticism, and dance, you just have to look past all those negative mentalities and Facebook statuses to remember why you fell in love with the dance in the first place. Let’s take some time to look into just three things to love about the Breaking Community. Bboying is very unique on the level that the average dancer did not start at a dance studio and or by taking classes. A lot of us started with just a friend teaching us a cool move that sparked our interest. From there it slowly built into going to practices at weekly sessions. Of course, do take workshops and classes because it will definitely benefit your dance and mindsets but I find it amazing that the support of free and cheap dance sessions is so great. A dance class can usually range from 10-25$, which would definitely seem way too expensive when you are young. With the Each One Teach One mentality, we are able to grow our community the way we see it without complicating things. All that beef during battles sometimes overshadows the true stories of these dancers. The constant vibing out and chilling with other Bboys/Bgirls that goes back behind the scenes is really what we should showcase. Bboys/Bgirls know the struggle of traveling to events and jams and always try to make your trip the best. They will go out of your way to house or find housing for you and everything from transportation to even feeding you. It is somewhat beautiful to see the hospitality that is given so graciously from people that you maybe met only once to basically strangers. I know, I know. This is a vague reason but why not!? When I mean Hip Hop, I mean the four amazing elements and the culture/lifestyle that is behind it. Nothing against the EDM scene, but PLUR (Peace, Love, Unity and Rave) is just a bite off of Hip Hop’s very own, Peace, Love, Unity and Having Fun. 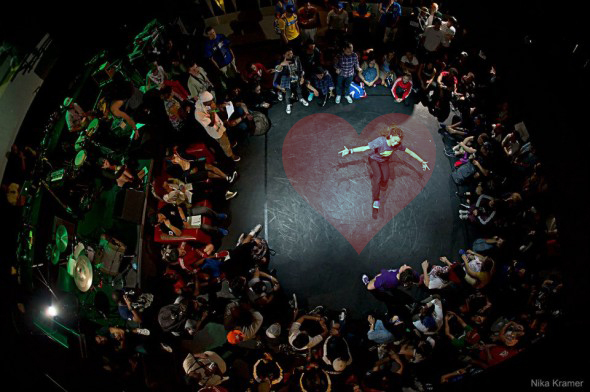 We all have our own reasons why we love and live Hip Hop and Bboying, this one doesn’t need anymore explaining. ← Floor Obsession Becomes Viral for Beastie Boys ‘MCA Day’!